The stage of breastfeeding is both an exciting and a daunting time for you as a parent. It’s a blessed time as mom and baby allowing you to obtain a new level of intimacy that will only enhance your bond together. It’s also a sign that your little bundle of joy is growing. However, the entire process can be as terrifying as it is exciting, and most parents will be looking for ways to make this transition as smooth as possible. With this in mind, nursing pillows are a fantastic accessory to have at home. Not only will you be able to support your baby in the right position while breastfeeding, but it can also provide you and your little one with all the comfort you need, ensuring a stress-free feeding session. To keep you in the know, here is a collection of some of the leading and most functional nursing pillows on the market, allowing you a comprehensive choice from some of the best of the best. 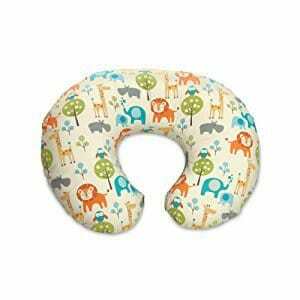 To start off my list, I’ve chosen this all-rounded nursing pillow that’s affordable while having you and your baby’s best interests at heart. This comfortable pillow is produced using 100% cotton fabric materials, ensuring that your baby is supported properly during feeding times. This pillow also prides itself on its unique curved ‘wrap-around’ design, that enables you to effortlessly position the pillow where you need it, while ensuring that your baby’s latch remains secure and comfortable. Thanks to this innovative design, this pillow also doubles up as a back rest, ensuring your body remains in a good posture during feeds, minimizing the risk of back pains and sore necks when used on a daily basis. This unique design also considers the position of your arms and elbows, ensuring that every part of your body is supported for minimal stress and risk of pain. 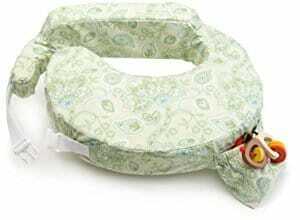 What’s more, the pillow is also flat and firm, giving your baby all the support they need while feeding. What's Great About It: One of the leading features of this intuitive pillow is the handy and convenient built-in pocket, designed to hold anything you need from bottles and burp cloths to phones and other essential items you may need quick access to. 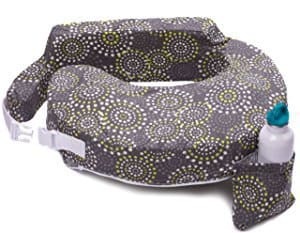 Available in seven unique and vibrant colors and designs, the Boppy Nursing Pillow is ideal for parents who want to find a high-quality nursing pillow that they’re going to love. This outstanding pillow is made from highly-durable polyester and cotton materials, providing you and your baby with optimal comfort and support during every single feeding session. Easily one of the most popular nursing pillows on the market, as voted by American moms, this nursing pillow also comes with its own cover. This cover can be easily detached and reattached, allowing you to effortlessly remove it, and since it’s 100% machine washable, it's easy to maintain the highest level of hygiene and cleanliness. Affordable extra covers are available for purchase, meaning you can be sure that your nursing pillow is always clean and ready for use. What's Great About It: This multi-functional pillow can be used for a lot more than just breastfeeding. 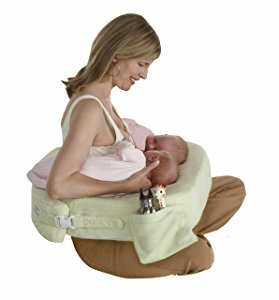 It can also double up as a prop for your baby while sitting on the ground, for helping them to sit up straight as they grow or even for providing your baby with full support as they lay and play on their tummy. As we all know, you’re not always going to be in the comfort of your own home when it comes to breastfeeding your child. My second entry from My Brest Friend ensures that this isn’t a problem. Made from 100% cotton materials, this unique and innovative nursing pillow is completely inflatable, meaning you can simply take it with you wherever you go, without it taking up too much space in your diaper bag. When you need to use it, you can simply inflate it using one of the two available airflow values, pop the cap on and you’re ready to go. You’ll also be able to enjoy the benefits of a wrap-around nursing pillow, no matter where you are or what you’re doing. Once you’ve finished, you can simply deflate the pillow, placing it back into your diaper bag for next time, meaning you’ll never be out of the house without it. What's Great About It: Thanks to this pillow’s lightweight and compact design, it is perfect for taking with you wherever you go. Whether you’re in town, at a restaurant, on a plane or staying somewhere overnight, you can enjoy the benefits of a high-quality nursing pillow. Moving on to one of the larger nursing pillows available, the Leachco Nursing Pillow is designed to be a leading seat wrap. This means you can sit on a chair or cross-legged on the floor and simply lay your baby in the most convenient, comfortable and supportive position possible for both of you, ensuring a stress-free experience every time. Due to the laid-back nature of the design, it’s suggested that this pillow can help to encourage and enhance digestive functions in your child while simultaneously reducing the risk of spit ups. This pillow is easily adjustable, allowing you to find the most comfortable position possible. 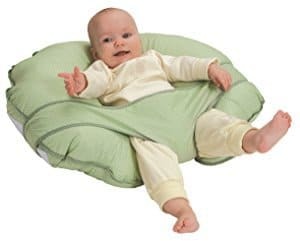 Furthermore, thanks to the large size, you can easily utilize this pillow as a floor cushion, making it ideal for your baby to spend time on their tummies or for support as they learn to sit up straight. What's Great About It: One of the leading features of this unique design is the seat straps that help to keep your child in place. These are comfortable, loose fitting straps that will stop your child from wriggling around, making it easy for you to retain your latch during feeds. 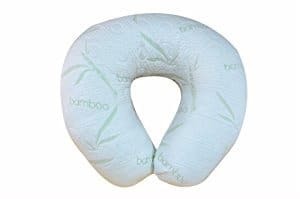 Made using a professional and tasteful blend of polyester and bamboo materials, this nursing pillow prides itself on being lightweight, compact and portable. It provides you with all the benefits and functions you would expect from a nursing pillow while gaining the ability to take it with you wherever you go. This nursing pillow has been specially designed for both you and your baby, ensuring you’re happy, comfortable and supported at all times. Thanks to the 40% bamboo cover of the pillow, your baby can benefit from the hypoallergenic properties to protect their well-being, while remaining soft enough to protect your child’s delicate skin from irritation. What’s more, this nursing pillow provides you with all the multifunctional features you would expect, including the ability to be used as a floor, while traveling and as a sit-up pillow, everything you could want and need in one convenient pillow. What's Great About It: In addition to the protective, hypoallergenic properties of this pillow, the cover can also be effortlessly attached and reattached while sporting machine washable properties, ideal for maintaining the highest levels of hygiene and cleanliness throughout your day-to-day life. To conclude my list of favorite nursing pillows is my third entry from the leading nursing pillow brand, My Brest Friend. With this deluxe nursing pillow, you’ll have the ability to feed your twins simultaneously without any reduction in the quality of you or your babies' support or comfort levels. This advanced pillow is produced using 100% polyester materials and prides itself on its adjustable features that ensure that it fits properly and comfortably. This unique nursing pillow also sports a removable cover that can be effortlessly detached and reattached thanks to the innovative zip feature, meaning you can easily keep your pillow hygienic and clean. To increase the support and minimize the risk of back and neck pain, there’s also an adjustable back support. What's Great About It: With your twin’s comfort levels in mind, the cover of this pillow is designed to be plush and soft, perfect for giving both you and your baby a happy and stress-free experience, every time you breastfeed. Related Reading: What is the Best Breast Pump for Most Moms? There are so many nursing pillow options available that it can be really difficult to make the right decision for you and your little one. No matter what you’re looking for, scroll down to discover my step-by-step buying guide, detailing everything you need to know, enabling you to make the most educated purchasing decision. One of the first considerations you’ll want to think about when purchasing a nursing pillow is the amount of support it will give both you and your baby. Regarding your baby, you’ll want to ensure that their body is firmly supported, as to stop them rolling over while providing them with the means to keep good posture. Likewise, you’ll want to ensure that their head and neck is firmly supported, as to minimize the risk of injury. You’ll also want to consider your own supportive needs. While breastfeeding multiple times a day, you won’t want to be bent or hunched over, nor do you want to strain your neck, as this can cause serious health problems. With these points in mind, consider what firmness your chosen nursing pillow will give you. Also look at the design and how it will fit your body and how your baby will fit into the pillow. If you want a happy and successful breastfeeding session, the comfort levels that your chosen pillow provides will be essential. The best way to test this is by looking for soft and comfortable materials such as polyester or cotton. The most comfortable material is bamboo, but it is slightly more expensive. If your chosen pillow has straps that go around your waist or over your shoulders, be sure that they are adjustable so that you can find the perfect fit. There’s no point in paying out loads of your hard-earned money on lots of various items and products if you can simply invest in one product that does it all. As you can see from my list of nursing pillows, many of these products can be doubled up as supportive pillows to assist your baby throughout the day. Many nursing pillows can also be used as ground cushions, perfect for supporting your baby’s body as they lay on their fronts, their backs or as they sit up. While feeding your baby, at some point or another, you’re going to experience a bit of sick, spit up and dribble. These can stain your nursing pillow and will cause bacteria to grow. Some of these bacteria may be harmful to your child’s health. When shopping for your ideal pillow, look for products that have removable covers. These covers need to be machine washable so you can simply pop them in the wash after you have fed your baby before drying it off so that it's ready for the next feed. As you can see, there are many benefits to choosing the ideal nursing pillow for you and your baby. By taking your time to ensure that you’re buying the perfect one, you’ll be investing in an essential accessory that you’ll use every day. With your nursing pillow by your side, you can be sure that every breastfeeding session is effortless, enabling you to focus on the enjoyable aspects of becoming more intimate with your baby.